Boat lifts used to be labor-intensive, but not anymore. Recent advances in technology are making boat lifts much easier to operate... here's how! Used to be your back could start hurting just thinking about hauling your boat out of the water. Boat lifts used to involve a constant battle to keep the boat centered while keeping the winch moving and the boat rising. Early innovations like geared winches and cantilevered platforms eased the strain on muscles, and modern manual boat lifts have gotten more fluid and easy to operate. “Manual lifts will always be a viable option,” says Jon Devitt, Vice President of Engineering for ShoreStation. “The up-front cost is low, and the system relies on a very simple mechanism with decades of proven history, which means safe, reliable operation.” But the biggest advances have come in the field of motor-assisted winches. Using electricity to power your lift is also a popular option. But picking between AC and DC might make all the difference. “AC power supply tends to be the largest and most expensive issue faced by the lakehome owner who is installing a motor-driven or hydraulic lift,” says Devitt. “DC lifts are a great alternative to AC powered lifts,” he adds. Typically, DC lifts use a deep-cycle marine battery to power the motor. The battery charge can be maintained using a ‘battery tender’ system or solar panels, or the motor can be operated directly from the boat. Early hydraulic systems, notorious for leaking oil and making a racket as their winch gears clicked and their cables clanged, have given way to smooth, silent operators. “Today, most hydraulic lifts use biodegradable oil, and hydraulic lifts are very fast compared to most motor-assisted winches,” says Devitt. But boat lift companies haven’t been content to rest on their laurels. Innovations continue in new, faster and smoother lift systems and accessories. You can upgrade your existing lift with add-ons from companies like Eastern Townships Docks or ShoreMaster. Both sell products that let you keep your existing lift wheel, but add an electrical assist to turn the wheel for you. The companies also sell power drives that replace your lift wheel entirely. 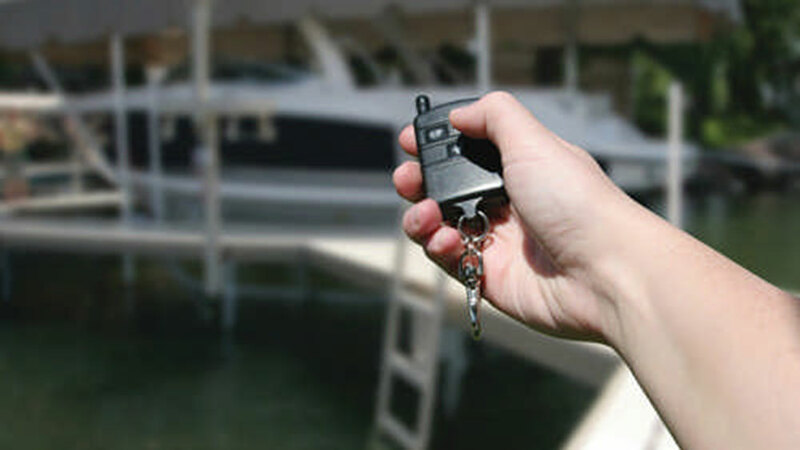 These assist units can be powered by your boat’s battery. If you’re looking to replace your lift entirely, ShoreStation’s Direct Drive system is capable of lifting up to 6,000 pounds and keeps all of the mechanical components protected in a weather-resistant, maintenance-free winch case. It’s available in three different power configurations and has an optional solar charging accessory. And FLOE’s Vertical Screw Drive (VSD) is faster than most other powered boatlifts, thanks to its super-efficient 24-volt battery, which has the ability to lift a 3,500 pound boat over 150 times on a single charge. And the best news for those who have experienced the pain? There’s no winch cable to replace. Ever. Modern boat lifts take a former cabin chore and make it a one-button wonder – so you can spend more time on the water and less time trying to get out of it. Most motor-assisted winch systems can be operated wirelessly. These wireless systems let you operate the lift from a remote and some even include security lockout features, which keep the lift from being used by unauthorized people. And check out solar-charged lift systems and stations. They keep your batteries fully charged to power your lift all season long. Andy Bennett doesn’t have a boat to lift, but he’s thinking about applying the technology to his garden and snow shovels.